Put Thriller on right now and you'll be amazed at how easily the troubling last years of Jackson's life melt away. For Generation X the magic is partly nostalgic; everyone between the ages of 35 and 45 remembers exactly where they were when they heard "Beat It" for the first time. But as a piece of music, it remains the greatest pop album of all time. "Wanna Be Startin' Somethin'" is the closest thing Jackson has to an overlooked song; not only does it open the album and set a frenetic pace, it also lays out Jackson's ambitious musical agenda  from the disco beat to the rock timbre of the vocals to the closing refrain of "Mama-se, mama-sa, mama-coo-sa," cribbed from a hit by Cameroonian saxophonist Manu Dibango. Thumping and fraught, "Billie Jean" is a sound track to a late-night walk through a sketchy neighborhood. It actually makes Michael Jackson sound dangerous, which is no small feat. Jackson never got much credit for being a pioneer, but "Beat It," his melding of rock and R&B, preceded the collision of Run-D.M.C. and Aerosmith by four years. Besides featuring a guitar solo provided free of charge by Eddie Van Halen (in a move his accountant no doubt regrets), it's the best example of Jackson's ability to bridge moods and genres. It's tense and spooky. It rocks you while you dance to it. Like all of Thriller, it's a sophisticated joy. On its way to becoming the best-selling album of all time (until it was eclipsed in 2000 by The Eagles Greatest Hits, 1971-1975), seven of Thriller's songs cracked the Top 10, and the record was immovable atop the Billboard chart for 37 straight consciousness-altering weeks. Consciousness-altering because Jackson was not just dominating the sound waves  he owned the world's airwaves too. After The Wiz, Jackson never had a major role in a Hollywood film. Didn't matter; in a way, he was too special a performer, too big a star, to be part of a director's vision. TV would be his multiplex, MTV his studio, in the minimovies that defined the genre. Sony Music boss Tommy Mottola, who tried to shepherd Jackson through the later, difficult years, is hardly exaggerating when he says, "There was nobody before Michael Jackson, and there will never be anybody after Michael Jackson, that can do for video what he did. It put the MTV culture into the forefront ... He totally defined the video age." In fact, it was Jackson's video that in effect forced the integration of MTV; until "Billie Jean," MTV was mostly lily-white and content to be so. "Billie Jean," the first video off Thriller, snapped the neck of everyone who saw it. Based on an absurd real-life incident in which a woman accused Jackson of fathering one of her twins ("She says I am the one/ But the kid is not my son"), the song is a denial of paternity  a celebrity's cry of victimhood. But the video is a straight-on display of Jackson's star quality. Any pavement flagstone his feet land on glows a magical green. His moves are no less radiant. The spins, the strutting and hunching, show what Broadway missed out on when Michael decided to make pop music instead. From "Billie Jean" to "Beat It" (both songs written by Jackson) was another leap forward, and up, with some dexterous star spins in every other direction. Jackson's first video connection to contemporary urban street life, it argues that, between fleeing and fighting, it's better to flee  dancing. The Michael character hears a rumble, dons his red jacket (the must-have fashion piece of 1984) and breaks up the battle by leading the gang members in a routine out of West Side Story but with starker, more staccato moves. A worldwide video as well as audio smash, "Beat It" helped send the MTV logo and format around the globe. For the next decade, if a performer wanted to promote a song, he or she had to make a minimovie to go with it. 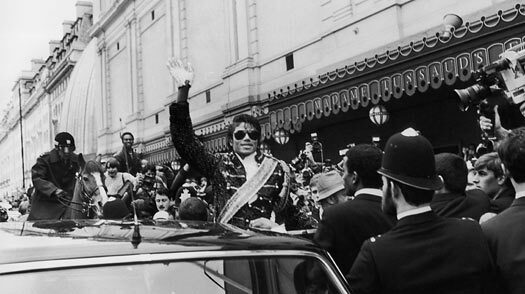 See TIME's video tribute to Jackson's 50th birthday.